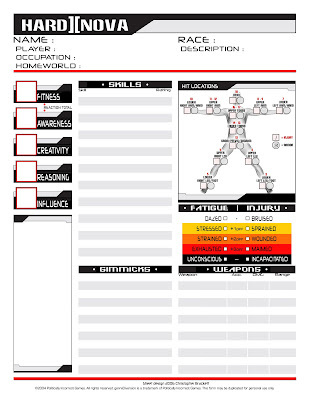 While we're on the topic of science fiction RPG's, I thought I'd share a character sheet I created for my favorite RPG that I've never actually played - Precis Intermedia's (formerly Poltically Incorrect Games) HardNova II. HardNova II is a great little rules-lite game. In 52 pages, the game's core rules manage to pack in robust rules for characters, including seven PC races; rules for starships; a basic and advanced task resolution system; a basic setting outline, including simple world creation rules; an "enemy" alien race and rules for creating other alien races; and four senarios. It's a nifty game that I really can't help but fall in love with all over again every time I look at it. I spent a lot of time compiling a "Galactic Guide" of technology and adapted races from my own imagination and a variety of sources, including Traveller, Star Frontiers, and two of PIG's other games, The Colonies and EarthAD. I'm still not sure why none of this work ever resulted in at least a game session or two. I think maybe it was just a matter of bad timing - as in my interests at the time were not in synch with those of my game group. Hit locations. My secret weakness! Another awesome character sheet. Good work! Hmmmm, wondering what a Sacrum is? And this made me realize hit locations seem as right to me for modern/scifi game as they seem wrong for fantasy games. I really like your style. The last few sheets have been really nice. Game companies should pay you to make them character sheets. Thank you for re-inspiring me and re-kindling the Character Sheet to send you. --This is gorgeous and fortuitous, as I am playesting WARCOSM ASSAULT for Brett, and the sheet will come in handy. @Paladin: Tell me about it! To this day I'm still enthralled by Bureau 13's hit location tables... oh, the beautiful character maimage! @Norman: The sacrum's the "large triangular bone at the base of the spine." Our group used hit locations once for a fantasy game - what a Charlie Foxtrot that turned into! (It's hard to enjoy the nuances of high fantasy when the party's elf has got a sheaf arrow lodged in her foot.) And I agree 110% - someone should pay me to make character sheets!